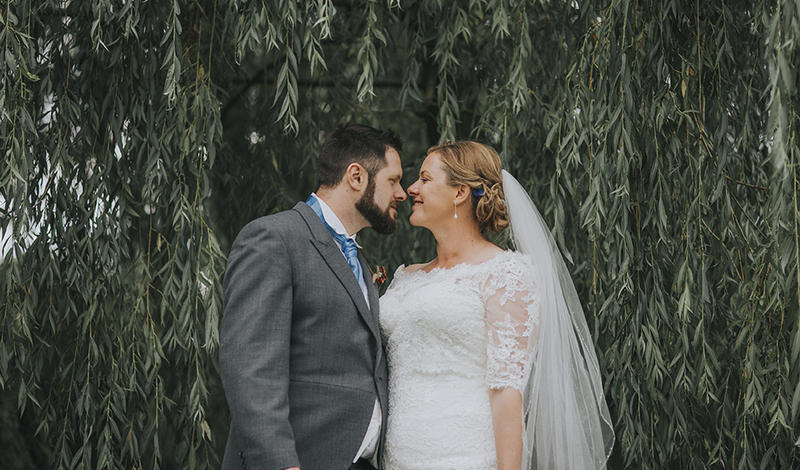 When teachers Abi and David got engaged, they knew they wanted their wedding to be full of their family and friends of all ages. 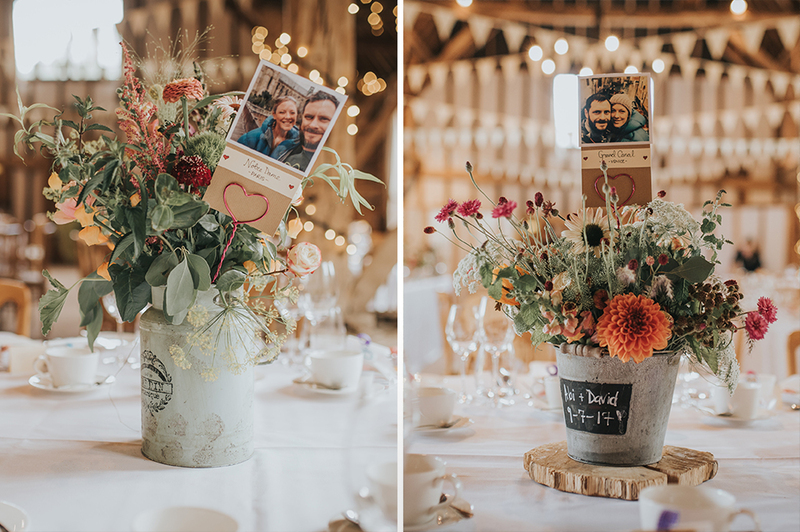 As a couple who love the great outdoors, a beautiful countryside wedding in the height of summer suited them perfectly and Clock Barn gave them everything they wanted. 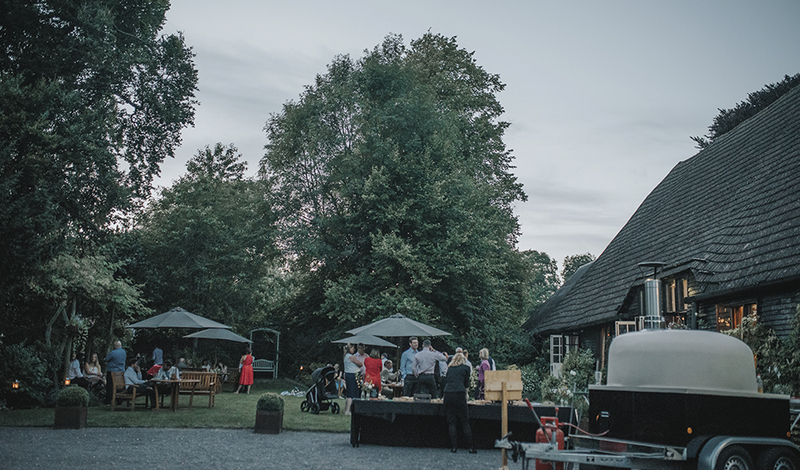 “We loved Clock Barn because of the variety in the indoor and outdoor space. It was the right size for our guests and had a dancefloor area separate to the dining area. There was also the ‘snug’ room, full of sofas and comfy chairs where our grandparents and guests with young children could have a bit of quiet time.” – Abi. 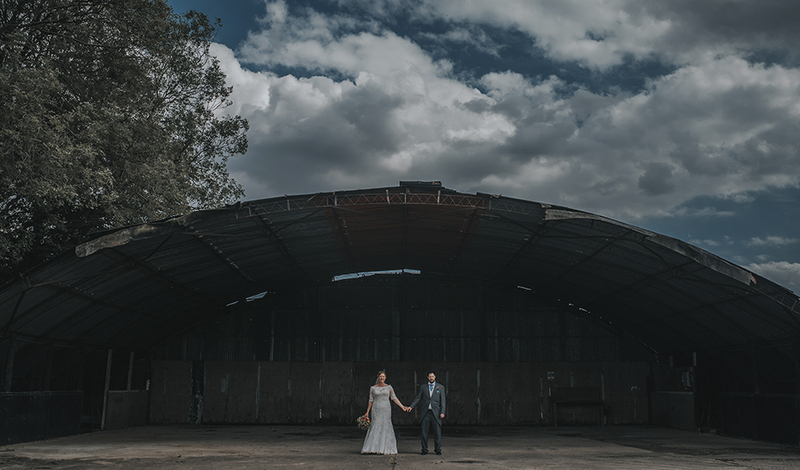 The couple were particularly smitten with the outdoor space at Clock Barn and adored the farm and field locations that they could use for their wedding photos. 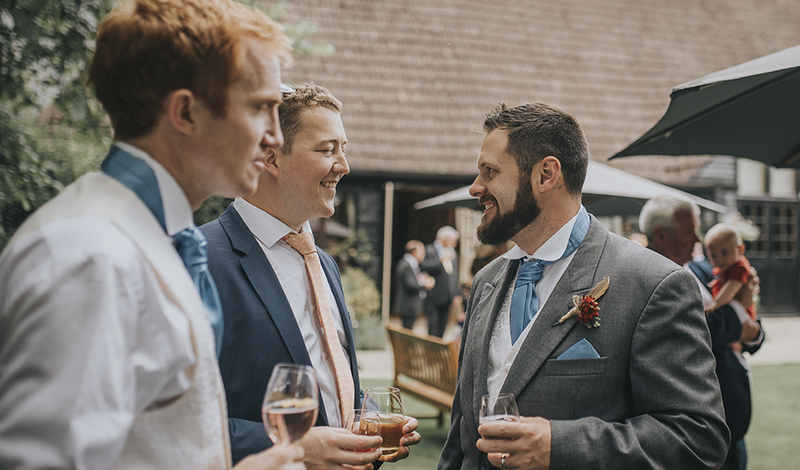 On the big day itself, with the temperature soaring and the sun in the sky above, all the guests were definitely able to enjoy the outdoor space which certainly pleased Abi and David. Having chosen a simple, rural wedding theme for the day, Abi and David began planning their décor. The flowers played a starring role in their day and were absolutely stunning. 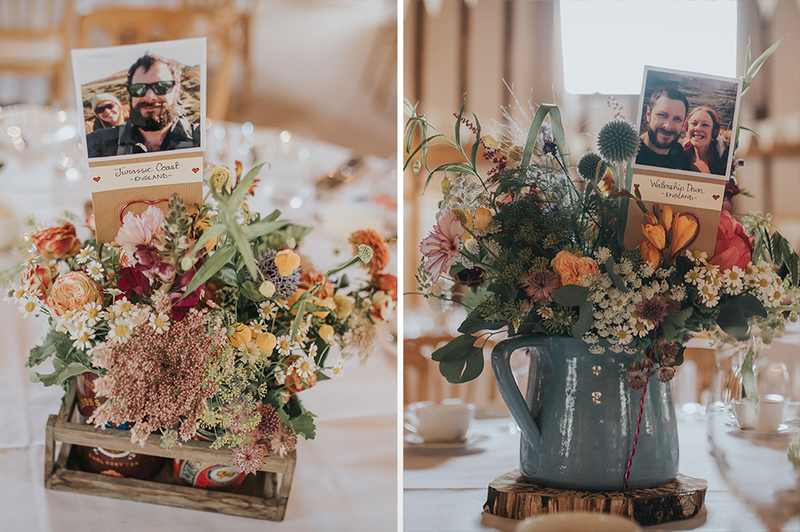 “We used lots of wild summer flowers in every colour possible. Our florist, Lindsey at The White Horse Flower Company, was a genius! She made the decorations for the church and the most beautiful table centrepieces. 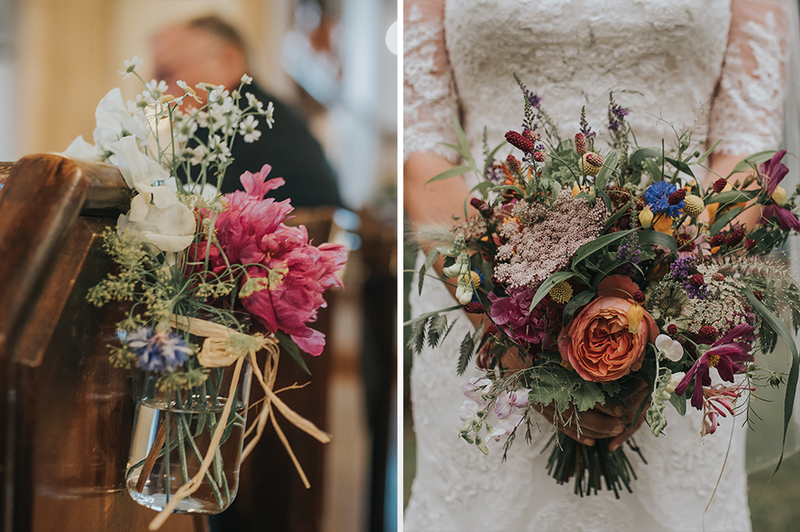 My bouquet was my favourite floral piece, it was really vibrant and reflected British hedgerows and fields in late summer.” – Abi. 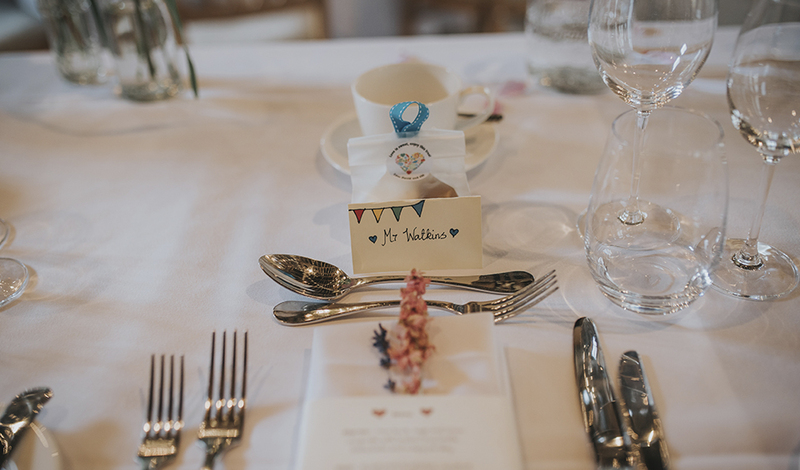 We chose plain white bunting and tablecloths and then made table numbers and the seating plan but just kept everything as simple as possible. The barn was already so beautiful that it needed very little.” – Abi. “The original dress underwent a huge amount of reshaping and then a lace, off-the-shoulder cardigan finished the look. In the evening, lace straps could be attached, along with a diamante belt, to make it a dance-worthy dress!” – Abi. 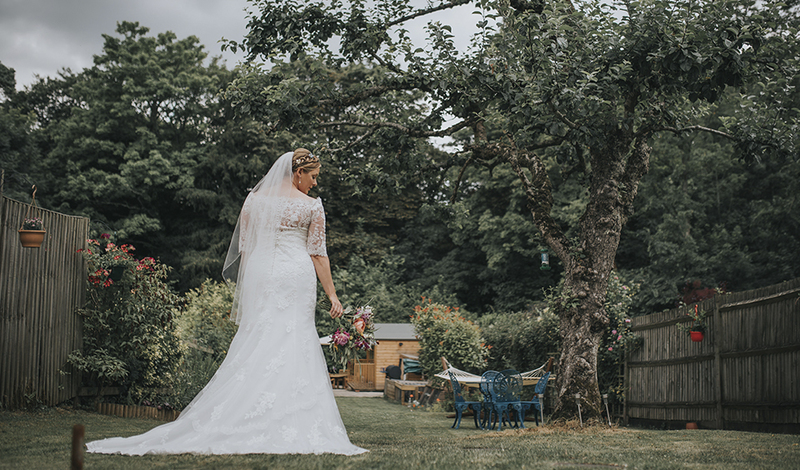 Abi completed her bridal ensemble with white lace shoes, diamond drop earrings, a bracelet given to her on her hen-do and her mother’s ring to borrow. For a final and personal finishing touch, Abi wore her grandfather’s war medals pinned to the inside of her gown. 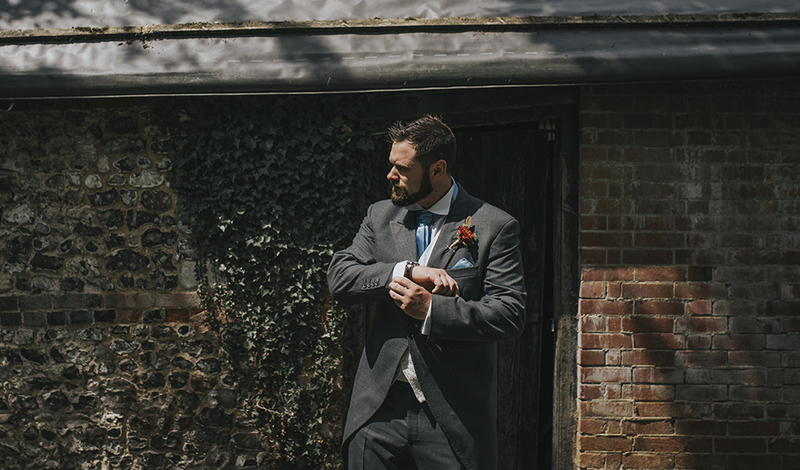 The groom and groomsmen wore three-piece morning suits, hired from Moss Bros, to work with the traditional feel of the day. 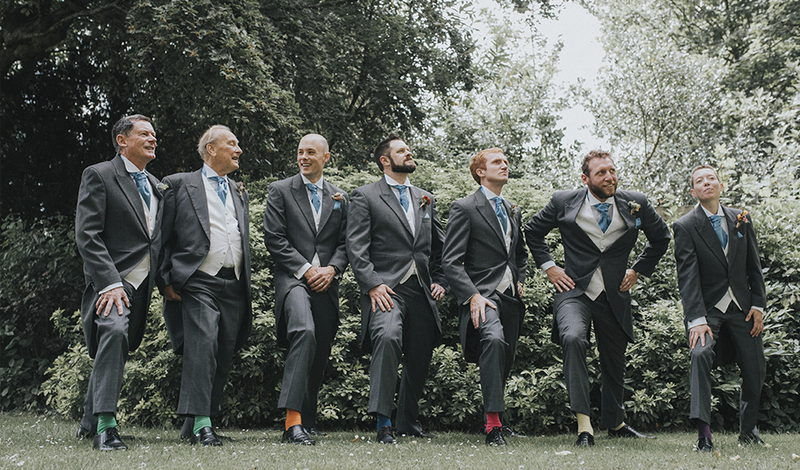 The bridesmaids wore dresses from For Her & For Him and Abi chose the colour to suit a sunny, summery day. 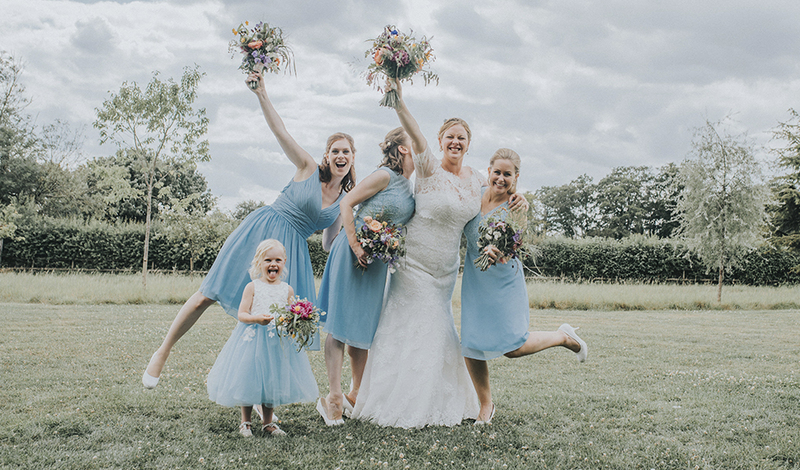 “I chose the colour of the bridesmaid dresses and then asked each bridesmaid to choose a dress they knew would suit their figure as I wanted them to really love their dresses. All the dresses were different but were actually so similar that few people could tell them apart! 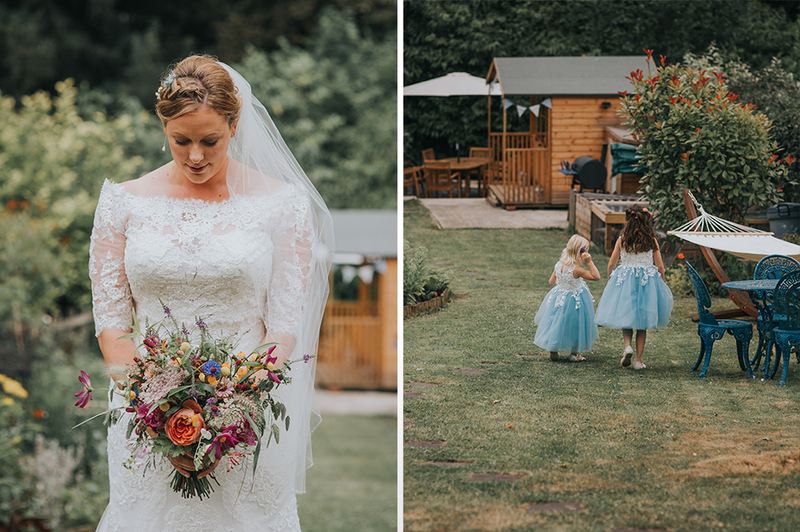 The flower girls wore ivory and blue fairy dresses and completely stole the show.” – Abi. 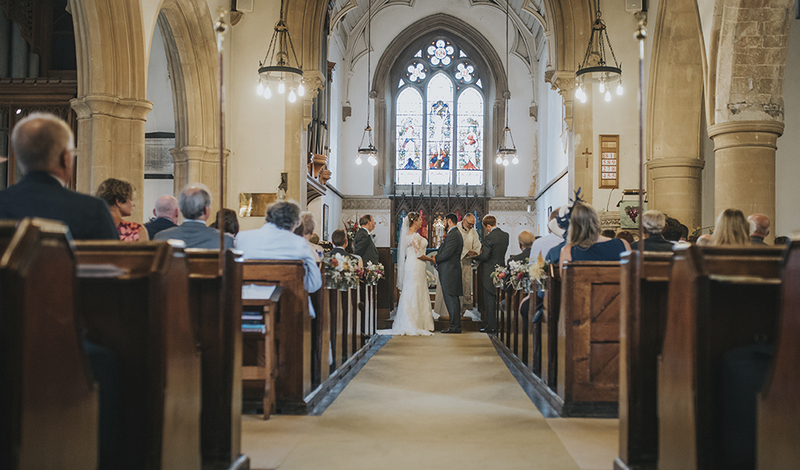 Abi and David held their ceremony at All Hallows Church in Whitchurch and specifically chose traditional vows and hymns. 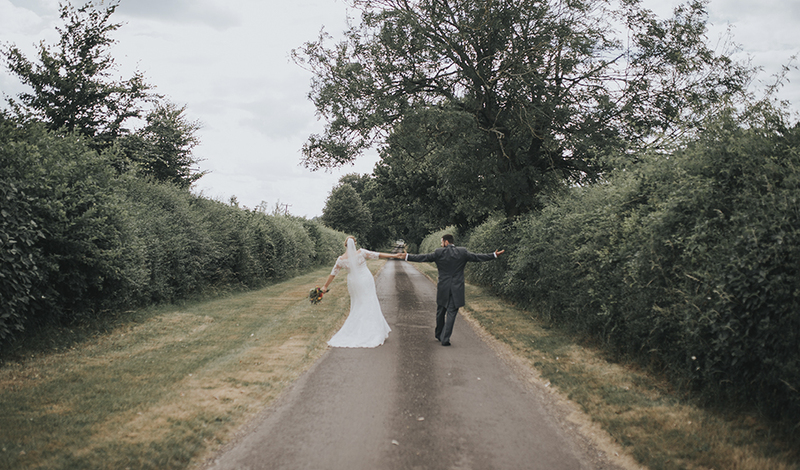 In fact, one of the hymns, ‘Praise my Soul the King of Heaven’, had an extra special meaning for the couple and it’s been sung in the past at weddings in both Abi and David’s families. 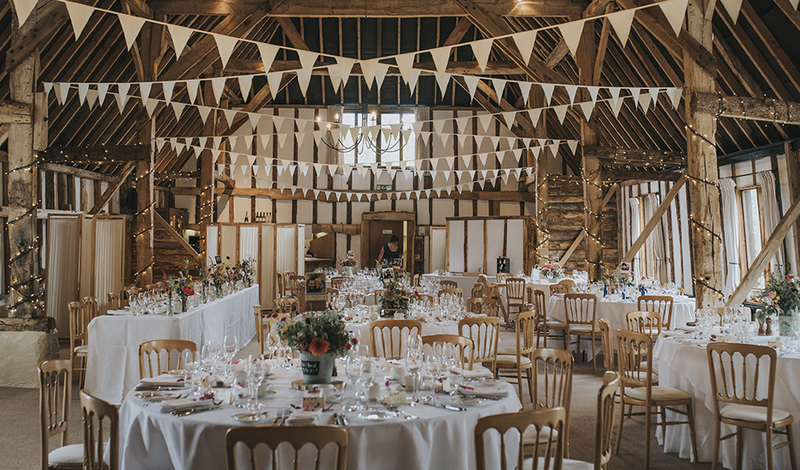 Once the newlyweds and all their guests arrived at Clock Barn, the festivities began with a drinks reception. 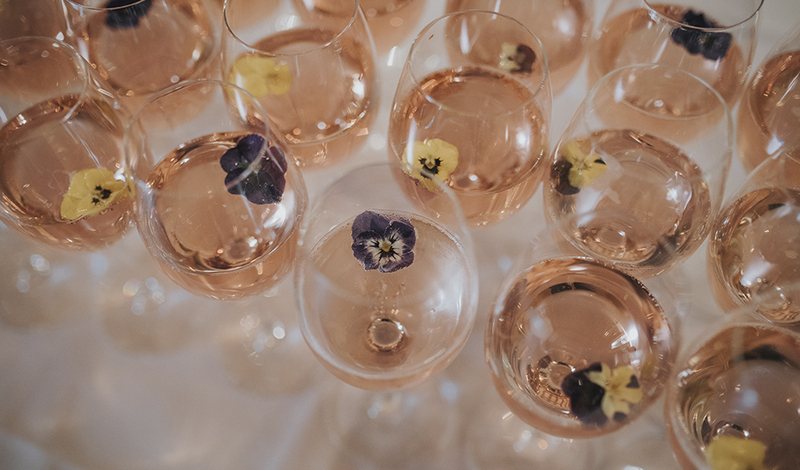 Peach sangria and elderflower and soda mocktails were perfect for the warm day and everyone enjoyed the canapes that included mini fish and chips and mini burgers. 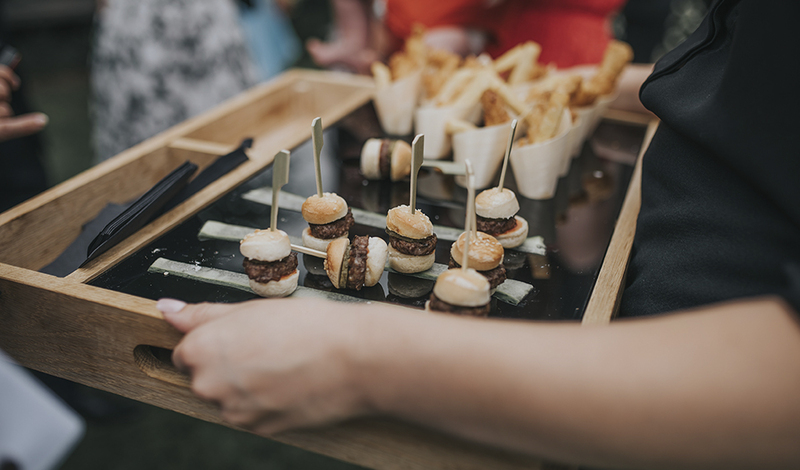 “Our menu was the result of a fantastic Tasting Event and there was just so much to choose from! We opted for a starter of ham hock followed by roast pork tenderloin and dessert was triple chocolate brownie with vanilla ice cream. We spoke to the chef as we were planning our menu and this was very helpful as we had a number of children, vegetarians and vegans to cater for. 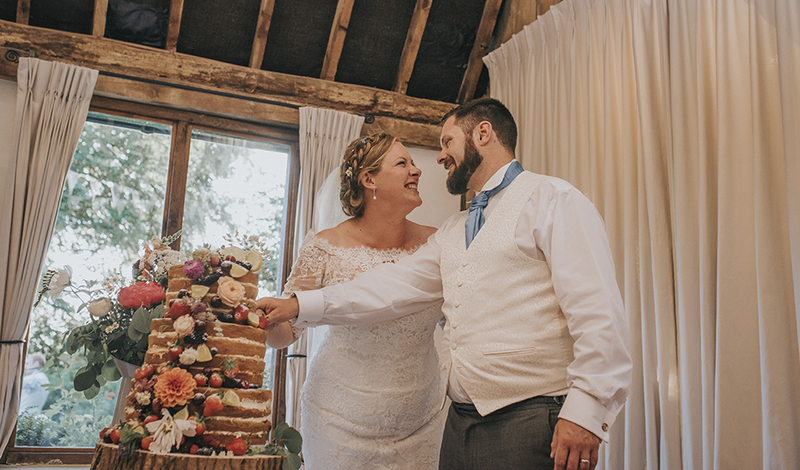 Galloping Gourmet were so helpful – they gave us exactly what they wanted and even produced a delicious vegan brownie and summer berries dessert.” – Abi. 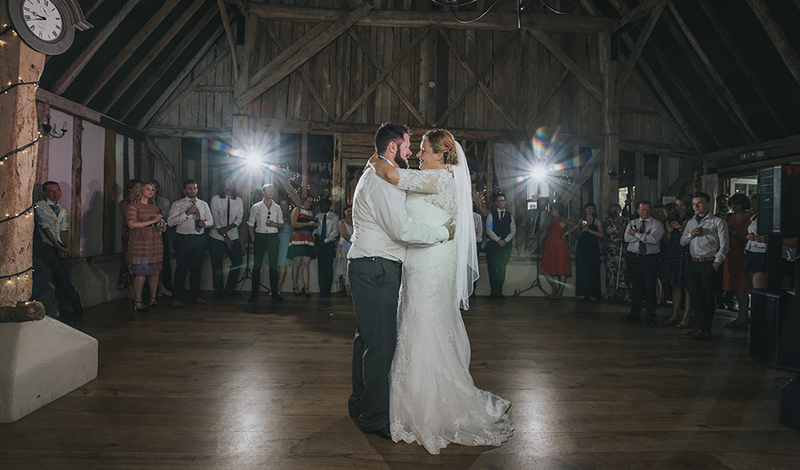 To kick off the evening reception, Abi and David danced to ‘The Luckiest’ by Ben Fold and then a brilliant live band, The Hitlist, packed the dancefloor all night long with a playlist that was incredibly varied giving everyone something to love. 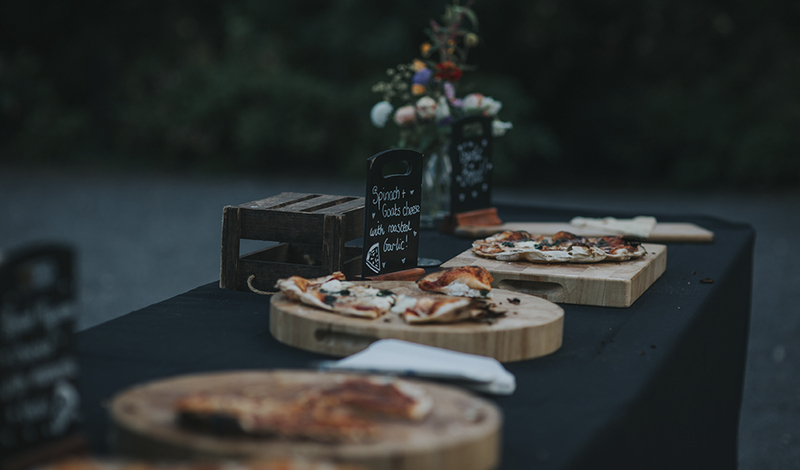 The outdoor pizza oven at Clock Barn was a huge hit too and everyone, including the additional evening guests, enjoyed freshly made pizza as the sun went down on Abi and David’s very special wedding day. “My favourite moment of the day was walking down the aisle as husband and wife and for our dreams to have come true. This was the proudest moment in both of our lives and the warmth and emotion that our families showed will stay with us forever.” – Abi. 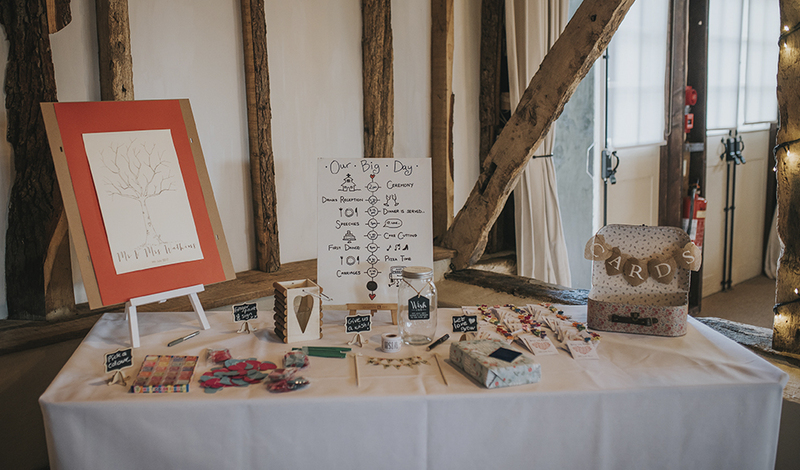 “I’d advise couples not to try and do everything alone – involve families and the wedding party as much as possible. This eases the burden, especially when there’s just so much to think about. Stay true to the people that you are so that when the day arrives, it reflects you and your love perfectly.” – Abi.